While POET succeeded in forcing ARB to conduct further CEQA analysis, this opinion was far from a total loss for ARB. Indeed, this opinion represents something of a best-case-scenario for ARB, and for the biodiesel industry, under the circumstances. The U.S. Commerce Department announced April 13 initiation of antidumping and countervailing duty investigations of biodiesel imports from Argentina and Indonesia. U.S. producers testified on the same date to the International Trade Commission. On April 4 the European Parliament voted 640 to 18 to pass a resolution to introduce a single certification scheme for palm oil entering the EU, in order to counter the impacts of unsustainable palm oil production, particularly in Southeast Asia. The European Parliament supports the move to exclude palm oil as a raw material for energetic use from 2020, at the same time acknowledging the sustainability of biofuels made from oil plants (rapeseed and sunflower) grown within Europe. A multi-institutional team led by the University of Illinois has proven sugarcane can be genetically engineered to produce oil in its leaves and stems for biodiesel production. Surprisingly, the modified sugarcane plants also produced more sugar. 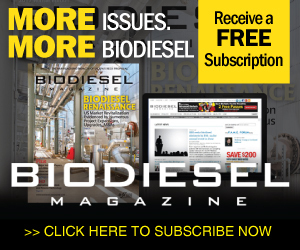 The owner of a New Jersey feedstock collector and processor was sentenced April 7 for his role in a scheme that generated more than $7 million in fraudulent tax and RIN credits connected to the purported production of biodiesel. Students are invited to express their views on energy solutions for the future in a 30-second video. The contest begins April 17 and is open to students in grades 6-12, and undergraduate college students in Amerigreen Energy's fuel dealer regions. With pilot test results at Ace Ethanol exceeding expectations, D3MAX, a bolt-on technology to convert corn fiber to cellulosic ethanol, plans to begin designing the first commercial-scale plant this summer with construction expected to begin by fall.